Our staff wants to meet the needs of all of our patrons. Please take a look at the following information. If you have additional questions contact us via our inquiry form or by calling 206-684-7200, TDD/TTY 7-1-1. McCaw Hall is able to provide sign performances for our hearing-impaired guests for select concerts. Interpretation services are not guaranteed for every event; however, we will make every effort to accommodate each request with appropriate advance notice, at least two (2) weeks prior to the event. Please contact 206-615-0363 for further information. Service animals are permitted inside McCaw Hall and must remain on a leash or in a harness at all times. Aisles need to be clear during each performance. If you intend to bring a service animal to an event, please notify the box office when you purchase your tickets so that an appropriate seat may be reserved for you. Standard ADA guidelines regarding service animals apply. The closest disabled parking is at the Mercer Street Garage directly across from McCaw Hall at 3rd Ave North and Mercer Street; there are 48 disabled parking stalls located on levels B and C. A covered, wheelchair-accessible skybridge provides direct access between level C of this garage and McCaw Hall. Any vehicle parking in the disable parking stalls are required to have the state-issued disabled placard or appropriate license plates. Patrons can be dropped off on Mercer Street directly in front McCaw Hall. Use the wheelchair ramp in front of the Phelps Center to reach the building, or select “Kreielsheimer Promenade” in the elevator located by the Nesholm Family Lecture Hall entrance on Mercer Street. A staff person monitors the skybridge entrance during specific events to facilitate wheelchair access directly from the skybridge. If the door is not staffed, take the elevator down to the Kreielsheimer Promenade level and enter via the north doors. There is ramp access and elevator access available at Mercer Street entrance as well as the south entry coming from campus. Elevators inside McCaw Hall are located at the north and south ends of the building. Use the south elevators to reach the Dress Circle. Complimentary Assisted Listening Devices are available for hearing-impared guests at McCaw Hall events. These ALDs use an infrared signal sent from the stage, similar to a television remote. ALDs are available just inside the ticket control area at the north end of the building near coat check. Guests will be required to leave valid identification which will be returned to you. If you are having difficulty using your ALD, please ensure that the ALD you have has direct line-of-sight to the stage. If you are still having difficulty using the ALD, speak with an usher. We have a number of wheelchairs that are available for guest use, on a first-come, first-served basis. Inquire with an usher when you arrive for your event. You are welcome to use them to get around the building and to your seat, however unless you specifically have wheelchair designated seating, you will not be able to sit in the wheelchair during the show. An usher can assist you as requested and ensure that the wheelchair is stowed away in an appropriate nearby location for you to use again during intermission and after the show. All restrooms are accessible and are available on all levels. For guest convenience, accessible Family Restrooms are also available on the south end of each lobby level. Concessions are located on all levels and have varying availability dependent on the event. The concession stands on the upper two levels (1st and 2nd Tier) may not be open. Prelude, Box Office and Gift Shop are located on the Kreielsheimer Promenade level. Please contact the appropriate box office to make accessible seating arrangements for the show you wish to attend. Aisles need to be clear during each performance. Unless arrangements have been made in advance of a show for you to sit in Wheelchair seating, walkers and wheelchairs cannot remain in the auditorium during shows. 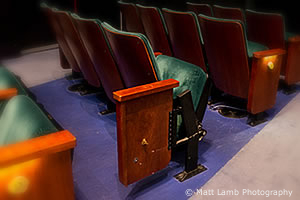 There are a limited number of transfer seats available throughout the Susan Brotman Auditorium. These seats have a movable arm that allows for easy transfer from wheelchair or walker to the seat. Aisles need to be clear during each performance. If you are not specifically sitting in designated wheelchair seating, walkers and wheelchairs cannot remain with you during the show. Usher staff can assist with stowing your walker or wheelchair in an appropriate nearby location. Additional accomodations may be available dependent on the performance or show. Patrons can call Event Services at 206-684-7202, TDD/TTY 7-1-1 for further information on contacting the show for these accomodations. Seattle Center Customer Service 206-684-7200, TDD/TTY 7-1-1. Yes, McCaw Hall is ADA compliant. You can read more about our various accommodations above. If you have a specific disability access need, please tell the box office when purchasing your tickets. McCaw Hall holds special needs seats as long as possible for our ADA patrons; however, if a show nears selling out, these seats may be released for general sale. 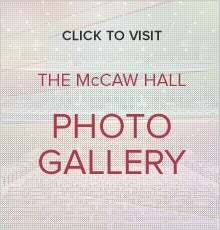 McCaw Hall is ADA compliant and we strive to accommodate the needs of all of our guests. Please read more about the different types of available accommodations in the section above. We recommend discussing your needs with box office personnel when purchasing your tickets. Feel free to contact us directly about your particular situation by filling out this form or calling 206-733-9725. McCaw Hall is able to provide Sign Language Interpretation for select concerts. Interpretation services are not guaranteed for every event; however, we will make every effort to accommodate each request with appropriate advance notice, at least two (2) weeks prior to the event. Please contact 206-615-0340 for further information. I use a motorized scooter. 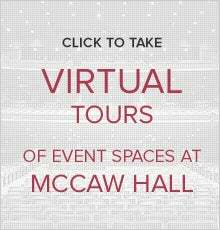 Are there restrictions in McCaw Hall regarding their use? Yes: Motorized scooters are allowed in all lobby spaces at McCaw Hall but not in the seating areas of the auditorium. If you need assistance from the lobby to your seat from the scooter, please inquire with your ticket taker or available usher. We can offer a transfer from your scooter to a wheelchair for travel to the seating area if necessary. Please note that Guest Services staff are not allowed to assist patrons in any way that is load-bearing. They can’t lift patrons out of scooters and chairs or in & out of cars, etcetera.